What Is a Fireproof Cabinet? What Is a Microwave Safe Container? What Needs to Go in a Flammable Cabinet? If you work in a lab, your work will bring you in contact with a variety of flammable chemicals like diethyl ether and hexane. If you work on repairs at home, you may also have flammable chemicals like paint thinner and turpentine around the house. Storing these materials in a "flammable cabinet" reduces your fire risk. Flammable liquid storage cabinets are designed to protect contents and minimize the risk a fire will spread to the materials inside. 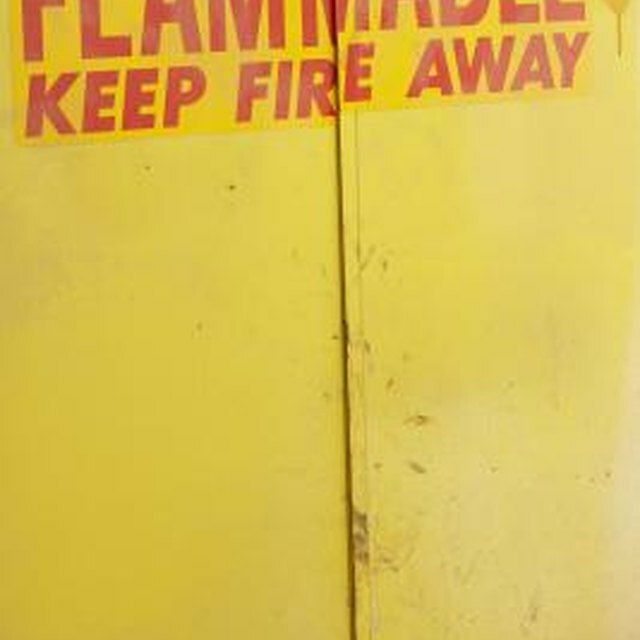 Flammable liquids should live in a flammable cabinet for safety. The flash point of a liquid is the temperature at which it creates enough vapor to form an air-vapor mixture you can ignite. As defined by the Occupational Health and Safety Administration, flammable liquids have flash points below 100 degrees Fahrenheit. These are divided into three different classes, IA, IB and IC, in order of increasing boiling point and flash point. All three classes need storage in your flammable cabinet. Examples include diethyl ether and acetone, both of which are common laboratory solvents. Combustible liquids have flash points above 100 degrees Fahrenheit. They are less volatile than the flammable liquids but they too are flammable and pose a fire risk. They come in three classes: II, IIIA and IIIB, in order of increasing flash point. Examples include cyclohexanol, naphtha and nitrobenzene. Just as with flammable liquids, the flash point for each and its ignition temperature are listed on the Material Safety Data Sheet or MSDS, so you can check the MSDS if you want to find out which category would include your chemical. Some materials should not be stored in a flammables cabinet. Inorganic acids and bases are corrosive and can eat away at the interior of the cabinet; they should always be stored in an acid storage cabinet, not a flammables cabinet. Strong oxidizing agents should never be stored in a flammables cabinet, because they can react violently with its contents and cause a fire hazard. Examples of strong oxidizing agents include chromic acid, potassium perchlorate and potassium permanganate. You should also pay attention to incompatibilities for specific chemicals, which will be listed on the MSDS. If two chemicals are incompatible, do not store them together. Always make sure flammable materials are stored in appropriate containers, regardless of whether they are inside a flammables cabinet. Portable tanks must have emergency vents. Containers should be compatible with the material they contain (don't store acetone in styrofoam, for example). Containers should also be in a secondary container like a tub or tray to contain fluids from spills or breakage. The total contents of a flammable cabinet should not exceed 60 gallons of Class I and II flammable liquids or 120 gallons of Class III flammable liquids. What Is Ceramic Glaze Made Of? What Are the Dangers of Using Non Microwave-Safe Dishes in the Microwave?